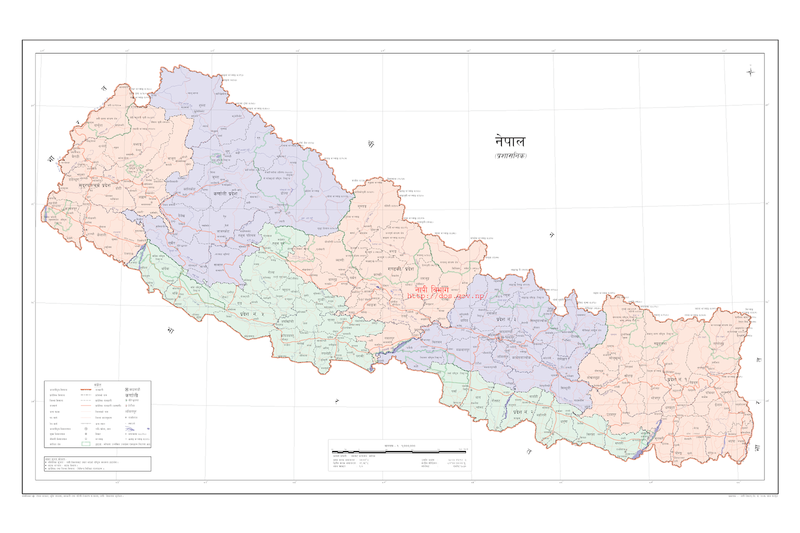 The Geographic Location of Nepal include the following facts. 22'N to 30°27'N Latitude and 80°4' E to 88°12'E Longitude in South Asia. Area: 147181 Square Kilometer (56827 Square Miles). 0.03% of the Total World Land Area and 0.3% of Asia. 1127 Km far from the sea (Bay of Bengal). Average East-West length of 885 km and Average North-South width of 193 km (145 km minimum and 241 km maximum). Total Border: 2926 Km. (1236 km with China and 1690 km with India). Tibet at North and 5 States of India(Sikkim, West Bengal, Bihar, Uttar Pradesh, and Uttarakhand) at East, South, and West. Time Zone: GMT +5.45, 86°15' E longitude (Mt. Gaurishankar, 7134m), 2042 Baishak 1.